Smiling pleasantly, his arms waving in the festive air. Innocent, virgin’ youth of their childhood hours. Ramshackle — dedicated, serious, committed to the cause. Life our school, knowledge of suffering our teacher. through which it’s impossible to see the stars. scattered through the universe, pockets of darkness between stars. always old the old sand always new. Falls through the white rain and hangs there. Between the first and last breaths, a blank disassembling. In the grey area, somewhere before dawn. Of the ancient cranium, under a patriot sky. Comes back to unsettle restive stagnant day. Black doldrums, then a stir, then tackle snapping. They have simply turned them on and gone. By the rock silverlings glide belly up. Antennae scraping the clouds... and then they’re gone. Nature has shut her doors. Spiraling like a stopped scream through the blind elms. That I might learn to be good from them. As he pedals off the unobserved cliff. The ice shelf collapsed, the dust cloud swiftly coming. At the beginning of the unread final chapter. with a sound like thin paper tearing. Did you suffer, or was it just the one who made you? the clock, and you alone had time for me? who forged you in his workshop of stupid toys? the door is opening; you aren’t coming out. 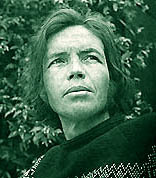 The American poet Tom Clark attended Cambridge University and Essex University in England in the early 1960s, where he edited a series of mimeograph magazines featuring a generation of younger poets who would also appear in The Paris Review during his ten-year tenure as poetry editor (1963—1973). He now teaches writing on the Core Faculty in Poetics at the New College of California in San Francisco, and lives in Berkeley. You can read an interview with Tom Clark in this issue of Jacket.